Two alleged gang members pleaded not guilty last week to killing a 19-year-old woman and her teenage friend whose bodies were found in a Montecito Heights park last year. Jose Antonio Echeverria, 18, and Dallas Stone Pineda, 17, who is being prosecuted as an adult, are charged with two gang-motivated murders in the killings of 17-year-old Briana Gallegos and her friend, Gabriela Calzada, 19. Their bodies were found near a hiking trail at Ernest E. Debs Regional Park on Oct. 28. Los Angeles police Chief Charlie Beck said the women were killed in a “horrific scene.” One victim was shot, he said. Both were bludgeoned, but he declined to say with what. The district attorney's complaint said Echeverria used a rifle to kill Calzada. Investigators, Beck said, believe no other people were directly involved in the killings. Authorities declined to go into further detail about a motive for the crime or how the suspects knew the victims. Shortly after a woman discovered the bodies, an uneasiness permeated the neighborhood. Residents gathered at community meetings, questioning whether they were safe. Some feared a serial killer was on the loose, a rumor that police quickly tried to dispel. The case was reassigned from Hollenbeck investigators to the LAPD’s Robbery-Homicide Division, which usually investigates high-profile or complex cases. Investigators examined forensic evidence and interviewed dozens of people, he said. Echeverria was initially arrested on suspicion of shooting at an occupied vehicle. Prosecutors also charged him with attempted murder, shooting at a car and bringing methamphetamine into a jail. Pineda, who is charged as an adult, is ineligible for execution because of his age. If convicted, he faces a maximum sentence of life in prison. They are due back in court for a preliminary hearing June 1. -- Times staff writers Kate Mather, Nicole Santa Cruz and Stephen Ceasar contributed to this report. 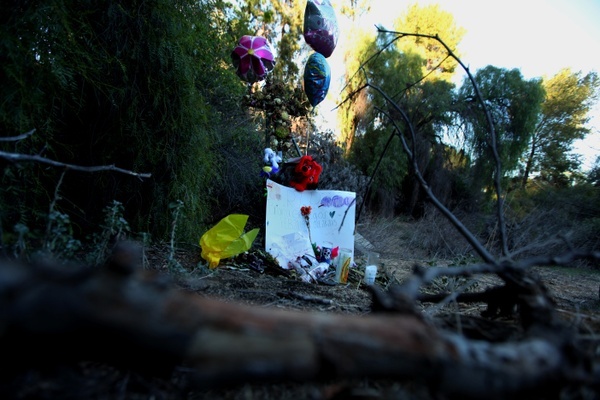 Photo: Flowers and other mementos were placed near where the bodies of Gabriela Calzada, 19, and Briana Gallegos, 17, were found in late October at Ernest E. Debs Regional Park in Montecito Heights.